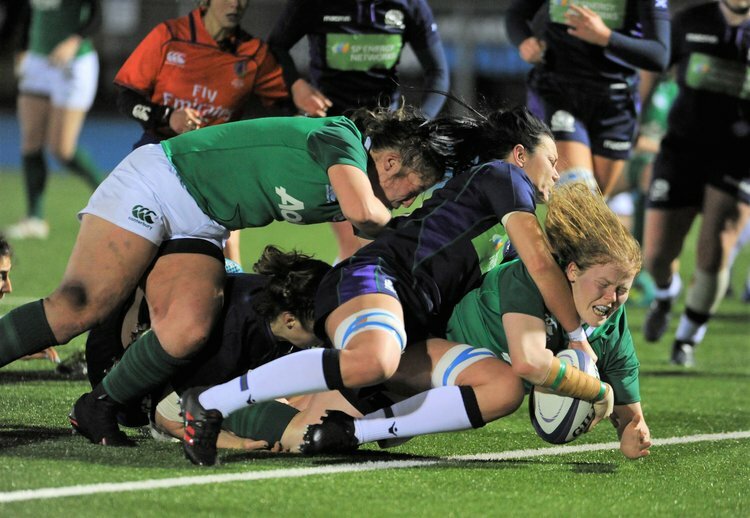 Ireland got their Women’s Six Nations Campaign back on track with a bonus point win over Scotland on a wet and windy Friday night in Glasgow, winning 22 points to 5. Ireland started the game well, applying pressure to the Scottish defence. This week, however, Ireland were able to convert their pressure into points, with Aoife McDermott crossing the line five minutes in to give the visitor an early five-point lead. Scotland responded well, with Chloe Rollie slicing through the Ireland defence before Hannah Smith crossed out wide after pick and goes from the pack. The momentum went back to Ireland with Leah Lyons’ driving over on the stroke of half-time. The score went unconverted leaving the score Scotland 5 Ireland 10 for the second half. Leah Lyons crosses before the break. Picture from Rugby People. Click pic to view their full match gallery. Ireland continued the second half where they had left it. Retaining the ball through phases to apply pressure on the strong Scottish defence. 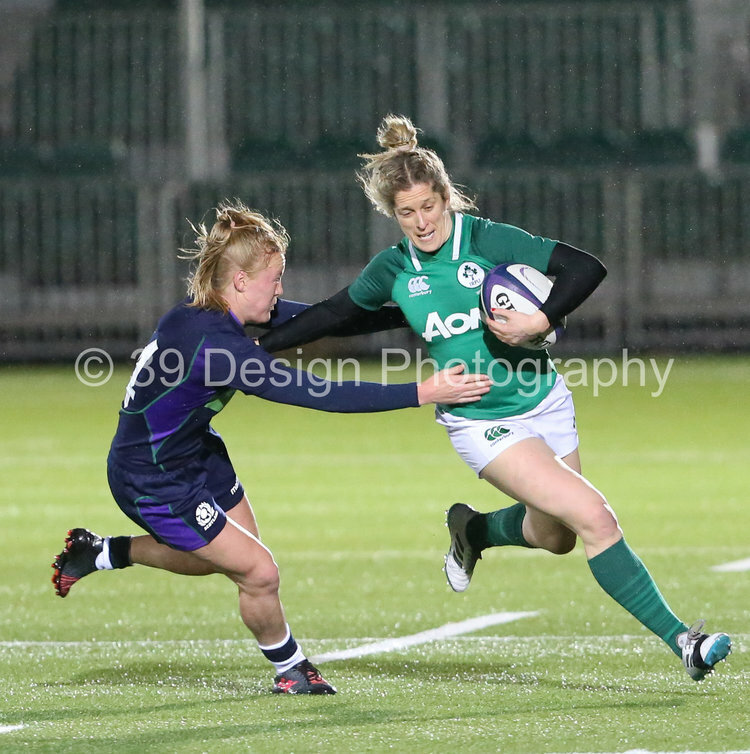 After powerful carries from the Irish pack Alison Miller was able to collect a low pass to cross in the corner, the returning winger showing her ability to finish opportunities close to the line. Ireland winger Alison Miller fends Scotland winger Liz Musgrove. Picture credit Photo 39 Design Photography. Click pic to view thier full gallery. Scotland tried to work their way back into the game but handling errors from both teams stinted a lot of attacking opportunities. Ireland were able to secure the bonus point on the hour mark with, player of the match, Anna Caplice picking from the base of the ruck to force her way over. Nicole Fowley was able to convert leaving the score as Scotland 5 Ireland 22. The performance was much better from Ireland this week, their set piece continued to look like a real strength, and their line out seemed to be functioning much better even in the wet and windy conditions. The week off now will allow the Ireland women to regroup before travelling to Rome to play Italy.